Depositing money at online casinos is a straight forward process and you will almost certainly find a site that you are able to sign up at and deposit in your own currency. Some countries like the Netherlands, USA and China place restrictions on their citizens bank accounts which stops many people from using their credit and debit cards, but the good news is that even this is not an insurmountable obstacle. This article will link you to the various deposit methods available to punters around the globe and give you insight into what the best method for you will be. If you need help identifying the best method for you contact us by dropping a comment in the box below and we’ll get back to you in quick time. The 2006 introduction of the Unlawful Internet Gaming Enforcement Act (UIGEA) has made it difficult for USA players to deposit online, with the laws forbidding online casino operators from accepting payments over the Internet from American residents, while USA banks also put blocks on any payments made to online gambling businesses. But there are still some options left, with offshore casinos that accept USA players offering secure deposits using Visa, MasterCard, Bank Wire Transfers, Cashier Cheques and cryptocurrency methods like Bitcoin and Litecoin. For more information about the casino deposit options available to US players, read our detailed USA casino deposits guide. Credit and debit cards are two of the fastest means of funding and withdrawing from your casino accounts as most transactions process instantly. 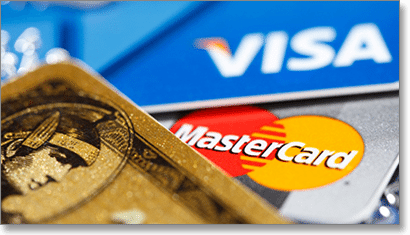 The two biggest brands, MasterCard and Visa, are usable in most Australian online casinos as a payment option, and both are recognised around the world as credible and reputable brands for credit and debit card transfers. MasterCard and Visa credit and debit cards are proven to be one of the safest and most reliable methods, thanks to the stellar security encryption and protocols of each company. Depositing or withdrawing money with Visa or MasterCard is a straightforward process. Users must go to their chosen Web casino’s cashier section and input their card information and the desired deposit amount. After verification, funds are instantly transferred and usually available to use right away – pending approval of the card. For withdrawals, the process is slightly slower, but you can expect to get your money into your bank accounts within 24-48 hours on average. For debit cards, you must have money present in your bank account to deposit successfully. For players wanting to deposit cash but are waiting for a pay cheque to clear, credit cards offer a helpful alternative. While other payment options such as American Express are prominent, these won’t be found at as many Internet destinations. American Express is quite selective about its exposure to online gambling, so you won’t be able to use it at nearly as many websites. Therefore, we recommend MasterCard and Visa as the top options – for both their proven service and wide support at the best online casinos, giving you instant access to your funds to play for real money. Bank wire transfers are used a lot to fund online casino accounts, especially larger deposits. This method lets you take money straight out of your bank account to fund your casino account, and comes with its own unique advantages – and a minor disadvantage in the form of some extra admin fees and processing times, unlike other options. One major benefit is security. As you’re transferring money directly between your bank account to your casino account, the bank’s state-of-the art systems protect your transactions and generally give us a little extra peace-of-mind. If you process the deposit via your financial institution’s online banking service – for example, Commonwealth Bank’s Netbank – this means you’re using the bank to deal directly with the casino, and none of your personal information needs to be offered. Depositing with a bank wire transfer is also instantaneous and preferable for high rollers, as bank transfers allow larger deposits to be processed in a single transaction and casinos allow a higher deposit maximum than other deposit options. One thing to remember when using this deposit option is that in reality you are transferring to another bank account – held by the casino. Most online casinos we endorse hold an Australian bank account so the transfers are made within 24 hours, but if you are depositing to an offshore bank account (held in England for instance) it might take longer. You can read the individual reviews of each of our endorsed casinos (accessible on the right) to find out specific details about their banking setup. Naturally, the most popular banks are supported by casinos for deposits and withdrawals, all of which are held to the highest standards of ensuring financial security. Pre-paid cards are recommended for players who wish to avoid any connection to their personal banking information. While every service and casino site we recommend implements state-of-the-art encryption technology and high-security to protect financial data, people have their reasons for not wanting gambling transactions to show up on their statements. Some examples of pre-paid services include Paysafecard (which now incorporates Ukash) and Entropay. We recommend Paysafecard as the top pre-paid supported services for all major online casinos. There are also MasterCard and Visa pre-paid and gift cards, which you place a desired amount of cash into and use to make a deposit online, making it discardable once tapped out. Pre-paid cards and vouchers work the same as debit and credit cards when used for deposits but unfortunately you can’t use them for withdrawals as they’re disposable. Essentially, the only difference is you’re limited to depositing the amount you have charged the card with. While the maximum amount of cash you can place on a card or e-voucher and then deposit is smaller than other methods, pre-paid cards are still a secure and easy to use option we highly recommend. E-Wallets, sometimes also called Web Wallets, can be used to move money around the Internet through electronic cash transfers. The advantage of this payment method is the sheer number of languages supported and the freedom to make both payments and withdrawals. Neteller and Skrill (formely known as Moneybookers) are the two most prominent e-wallets in online gambling, with both serving over 1,400 real money gaming sites. 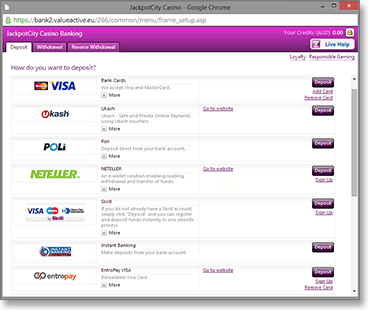 Other popular and supported E-Wallet services at major Internet casinos include ClickandBuy, ecoPayz and EZIpay. Some lesser known services such as Instadebit, eCheck, Nordea, iDeal, Giropay and CartaSi aren’t as supported to the same extent. One major advantage of using certain e-Wallet services is the potential bonuses and match deposits you can get with online casinos. Several of our recommended Web casinos, such as Royal Vegas, Platinum Play and 7Sultans all offer a 10% deposit bonus if players fund their accounts using Neteller or Skrill – check the banking section of these sites for information on the bonus codes. If you’re a player looking to make the most out of your deposits, E-Wallets are highly recommended. Processing withdrawals generally takes a little longer than deposits, with the time between transferring money from your casino account to a personal bank account averaging around 24-72 hours depending on your financial institution. Other than that, the process itself is as easy as deposits; go to your casino’s ‘banking’ or ‘cashier’ section and input the amount of money you wish to withdraw. Take note casinos will require a form of identification (driver’s license, for example) before you can successfully withdraw. You may also require additional documentation, such as a utility bill, to confirm your address. All of this is part of the high-standards of security each of our recommended casinos implement across the board. Not all services you use for deposits can be used for withdrawals. While direct bank transfers are naturally an option and many e-Wallets such as Neteller and Skrill also support withdrawals, make sure to check on our individual reviews of each service to see if it supports withdrawals in addition to deposits. If you’re a high roller looking for more information about making large deposits and withdrawals, read our guide to depositing $50,000 at an online casino site. For the safest and most secure real money deposits and withdrawals, we highly recommend Raging Bull Casino as the best online casino providing real money services to players from United States. You will find some excellent welcome bonuses available here when depositing with real money for the first time.